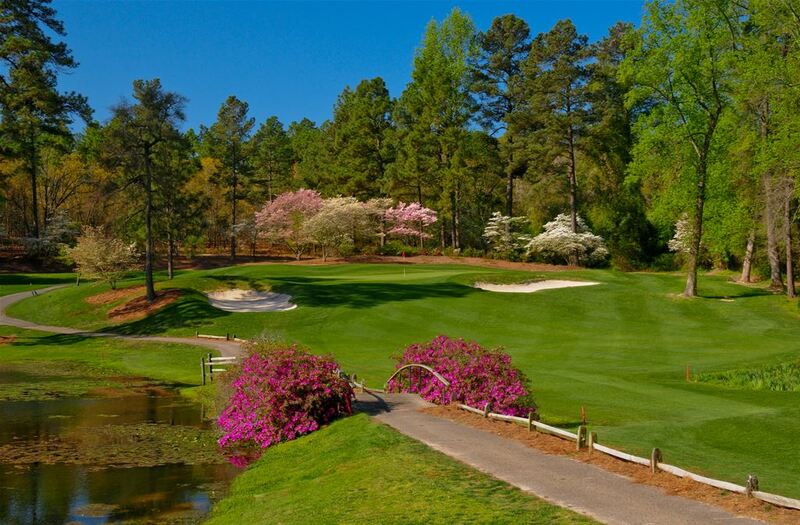 7 Lakes Golf Club offers the best value in golf for North Carolina Golf Packages. 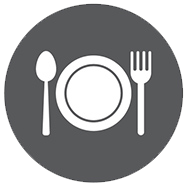 Every round is all inclusive golf, providing free breakfast, lunch, and 2 draft beers! 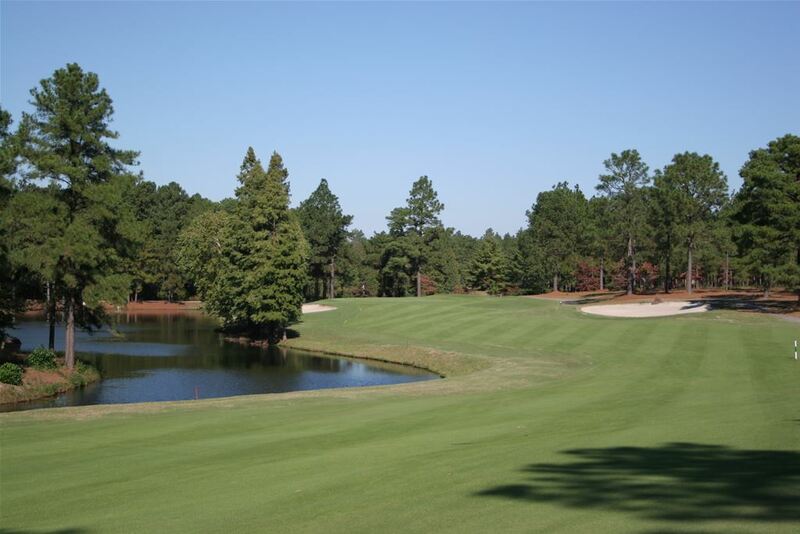 Pick 7 Lakes as one of your Pinehurst golf packages, golf courses and play a "Golf Course of the Year". 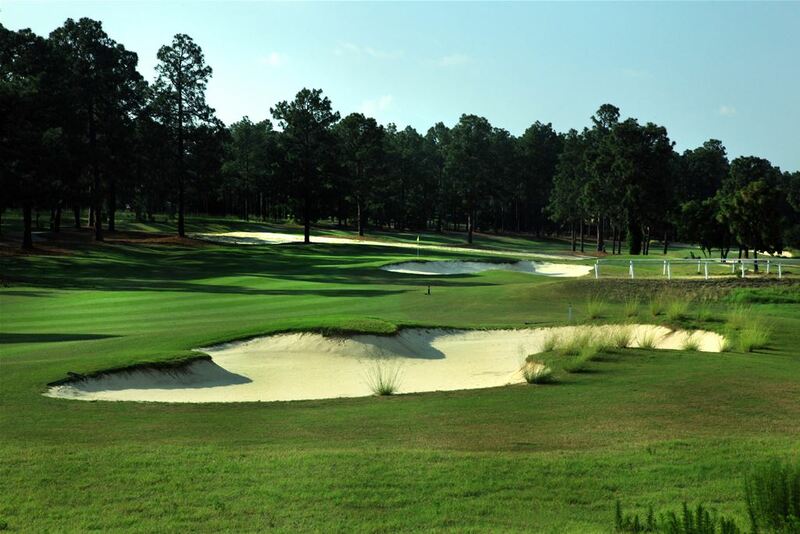 Also enjoy the beauty of Sandhills North Carolina and play a favorite among golf package groups! 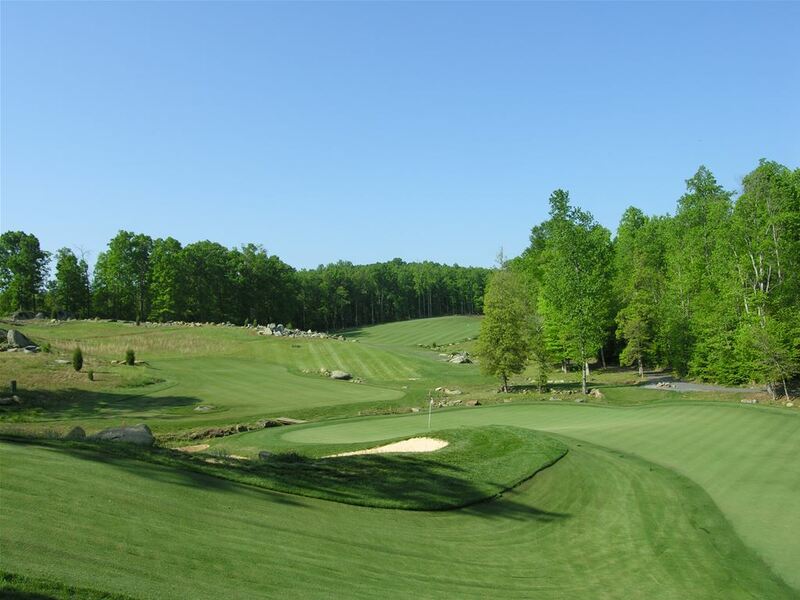 Anderson Creek Golf Club was designed by Davis Love III and is his first signature course in North Carolina. 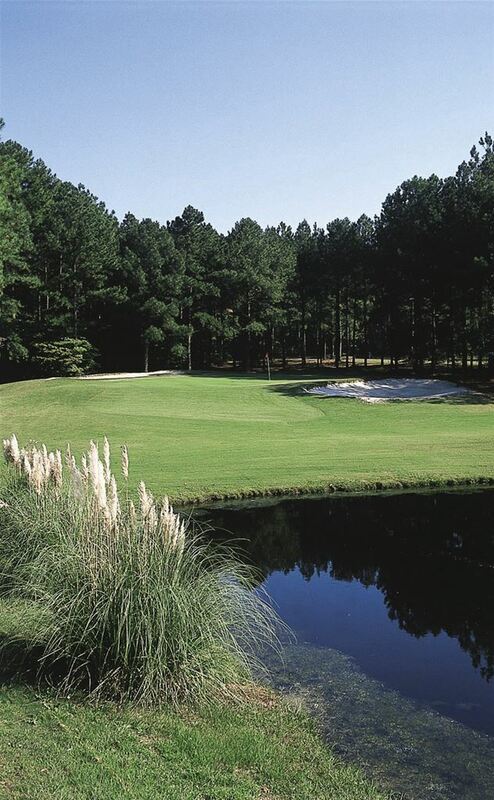 Anderson Creek was rated 4 1/2 stars by Golf Digest in 2008 and also won the "Best New Course in NC" award in 2001. 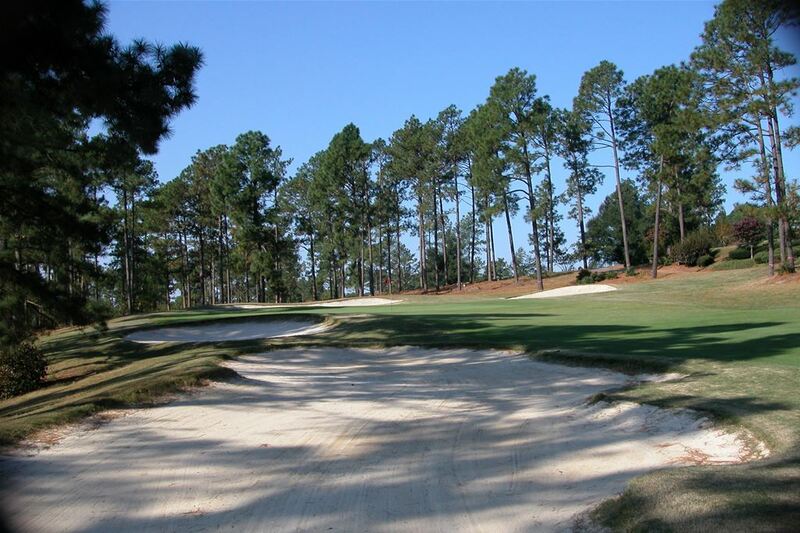 The traditional course layout shows what is great about golf in the Carolina Sandhills area. Golfers will enjoy rolling fairways lined with longleaf pines, natural areas with love grass and well-manicured course conditions. The greens have large roll-off areas and undulations that offer a glance into the classic Donald Ross architecture seen throughout the Sandhills area of North Carolina. Bayonet at Puppy Creek was sculpted through the rolling hills around Puppy Creek. A traditional style course that has 18 different holes that will keep you involved throughout your round. This may be the "best kept secret in the Sandhills". Rolling hills, towering pines, and a challenging layout are featured in one of the prettiest courses in the Pinehurst area. Rated four-stars by Golf Digest, Beacon Ridge meanders through wooded terrain with undulating greens and mounds giving golfers a terrific round in a relaxed club setting. The Creek Course is the second eighteen at Carolina Trace, which opened for play in 1979. The Creek Course features drastic elevation changes, rolling terrain, and a meandering creek interspersed among the 18 holes. PLEASE NOTE: Course will be closed June 4 through August 31. Greens are being converted to Bermuda. The Lake Course is one of two 18 hole courses at Carolina Trace. Designed by Robert Trent Jones, Sr., the creativity of design is apparent in the Lake Course and remains visible on every hole. The Lake Course winds around the 315-acre Lake Trace with such captivating views that maintaining focus on ones golf game can be difficult. 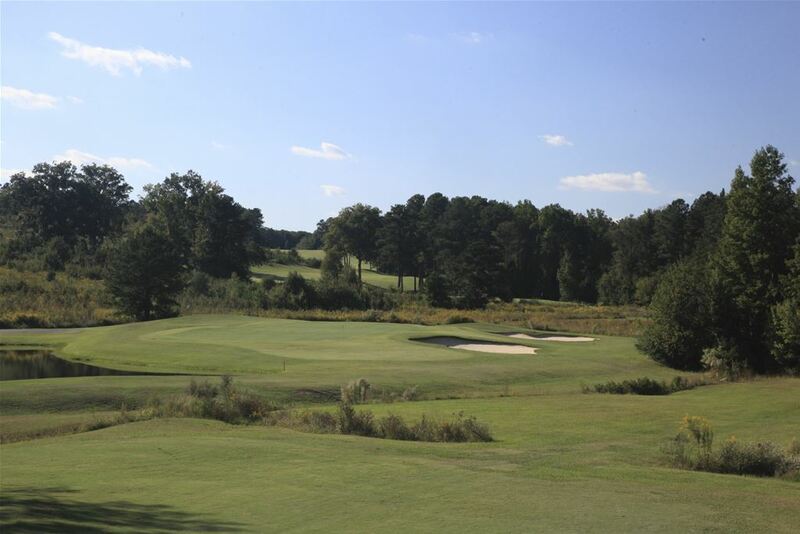 Deercroft Golf Club was called the "Best Kept Secret in the Pinehurst area" by Golf Digest and provides a great golf course at an outstanding value located just South of the Village. 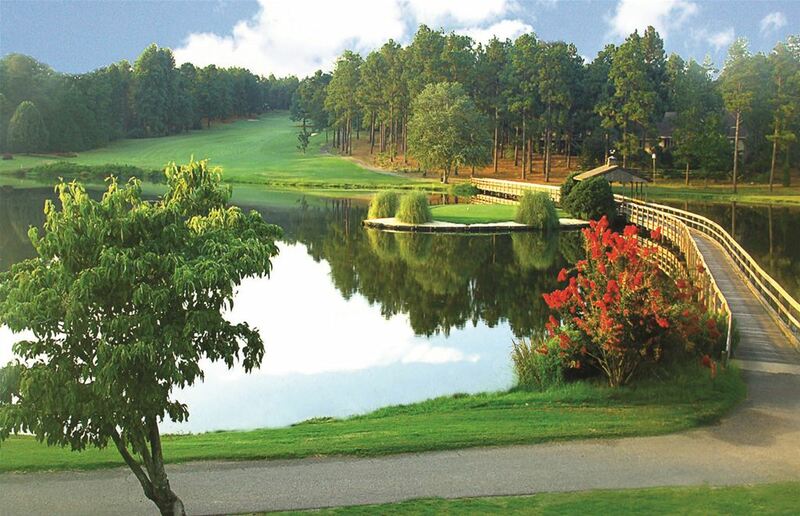 Deercorft is a semi private golf course that is carved out of magnificent pine forests, with over a 70 acre lake. The course offers some of the most scenic and challenging tests in the North Caolina Sandills. Designer Gene Hamm allows you to experience classic golf when you take the challenge of the East Course at Foxfire. The design uses the natural terrain of the land and challenges players of all skill levels with tree-lined fairways, strategically placed bunkers and generous greens. From the challenge of the tough par 5 first hole to the final approach shot along side of Lake MacKenzie at the signature 18th, you'll be rewarded by the beauty and conditions of the East Course at Foxfire. 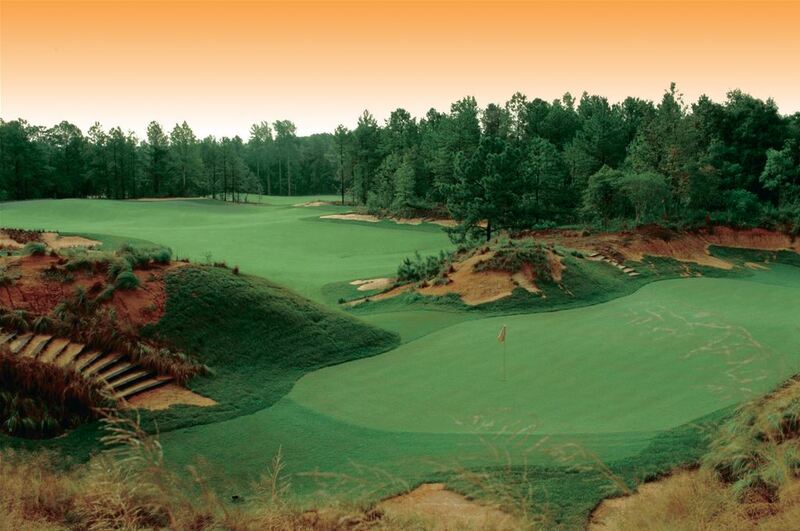 Foxfire West Course is formerly known as the Red Fox was designed by Gene Hamm. The course offers wide fairways and large elevated greens. Water comes into play on 6 different holes that require forced carries from the back tees, however you do have the option to around the hazards from the forward tee boxes. The course provides high risk/high reward golf with the G-6 hybrid bent grass greens to help hold your shots. The Hyland Golf Club features new greens and is the most played 18 holes of golf in the area. This Tom Jackson masterpiece is built on the highest elevation in the area creating spectacular views. 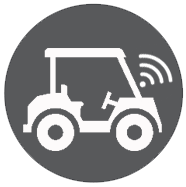 The course offers a fun, traditional layout, and unique cart trails. Rated a "4-Star Golf Digest Must Play" makes this course a great selection! Legacy Golf Links a Nicklaus design has been rated 4 1/2 stars by Golf Digest. This award winning layout represents classic golf with rolling hills and tall pines. Legacy features four of the best par 3's in the area and you probably won't forget Legacy's 18th hole, properly nicknamed "The Bear." Little River is one of the areas premier courses. Receiving many accolades, the course is built on 700 acres of rolling hills the course features nearly 200 feet in elevation changes. Narrow rivers and forests protect this challenging layout. 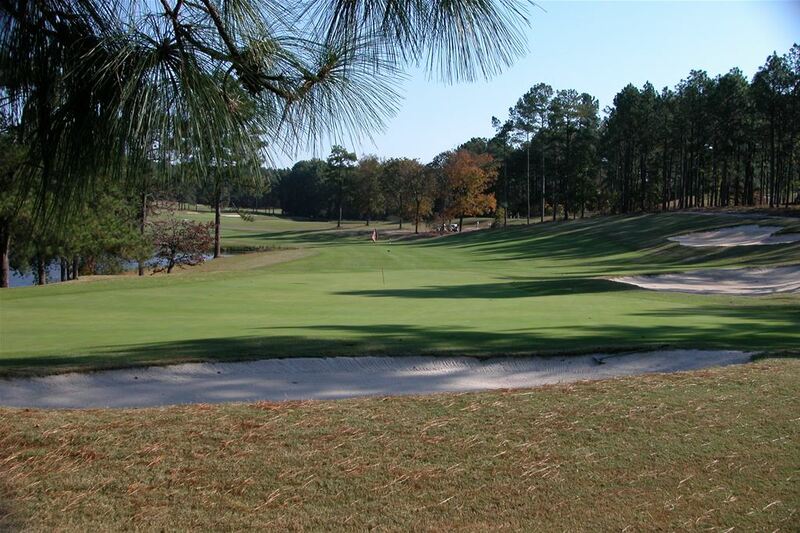 A Golf Digest 3.5 star golf course, Little River offers some of the best greens in the Sandhills area. 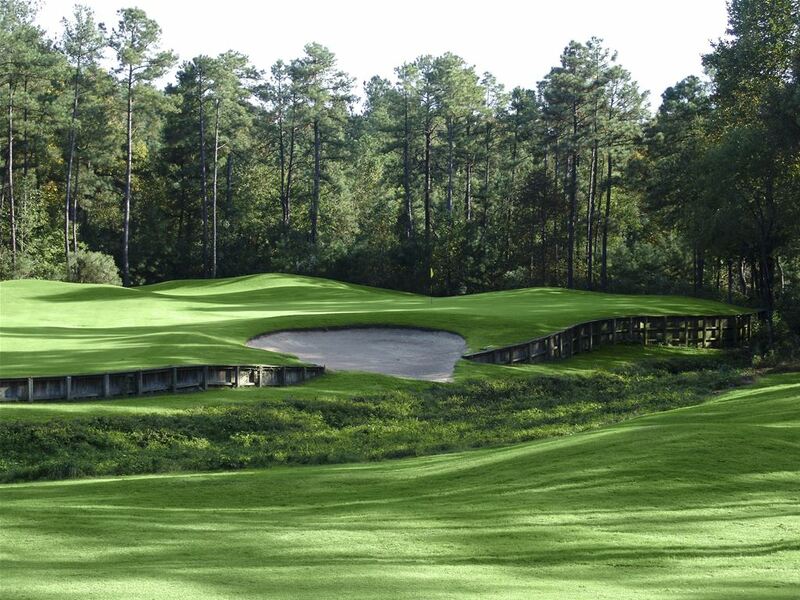 Golf course designer Dan Maples has created another masterpiece called Longleaf. 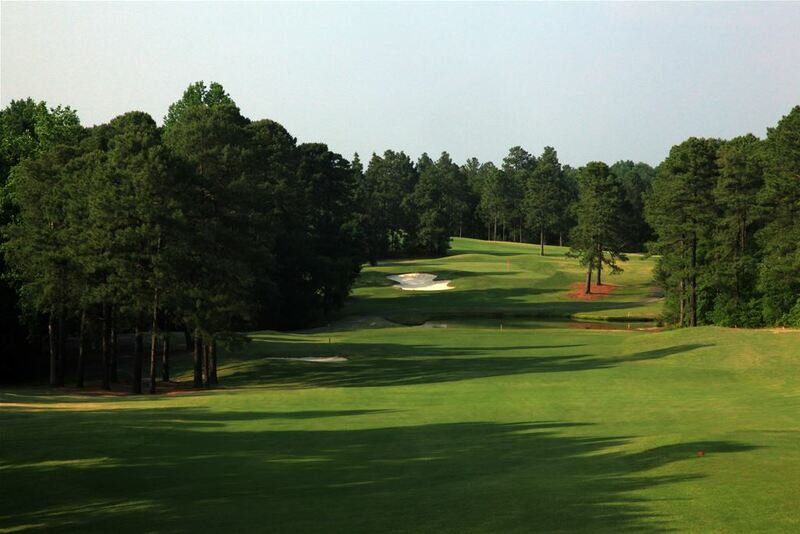 One of the most popular and playable golf courses in the Pinehurst Area, Longleaf Golf & Country Club is both challenging and diverse. Mid Pines course is "Pure Donald Ross" with design remaining the same as it did when built back in 1921. 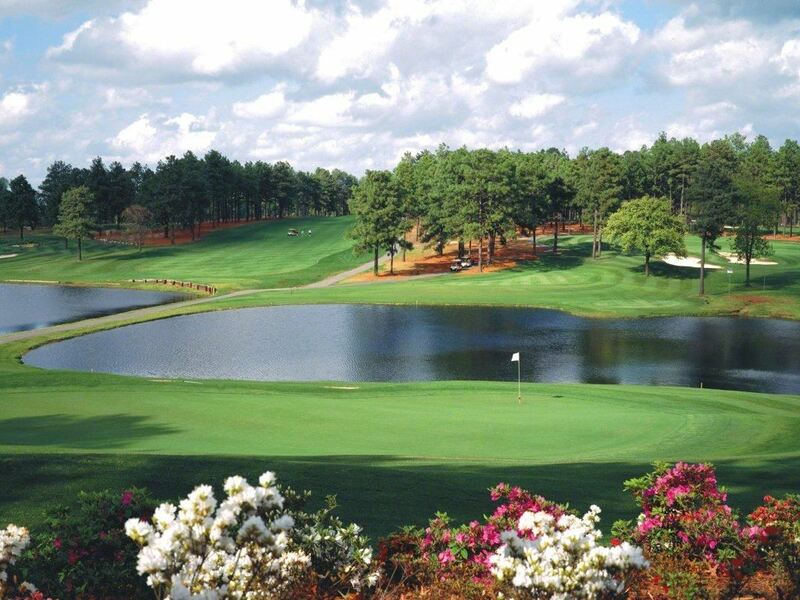 A great high end Pinehurst golf course and great for any Village of Pinehurst golf packages. 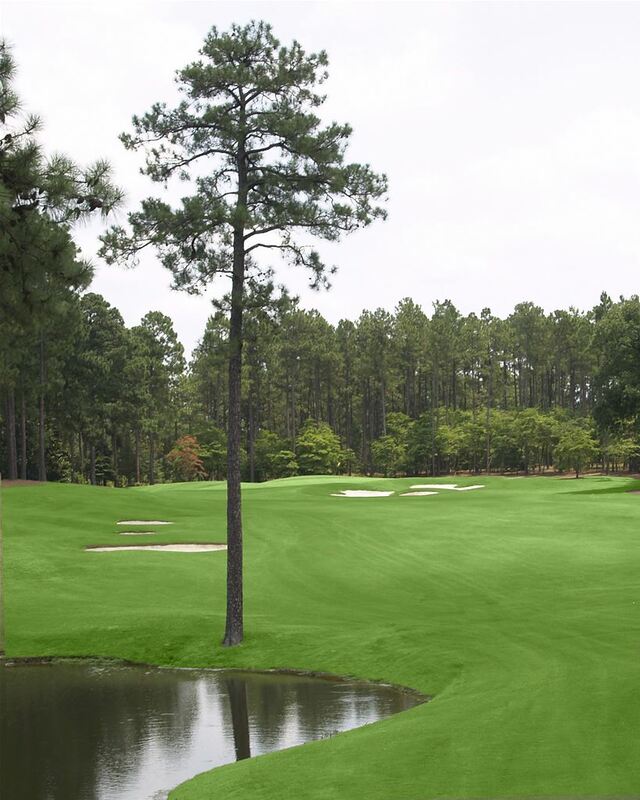 Mid South is was designed by Arnold Palmer and is located just few minutes outside the Village of Pinehurst. 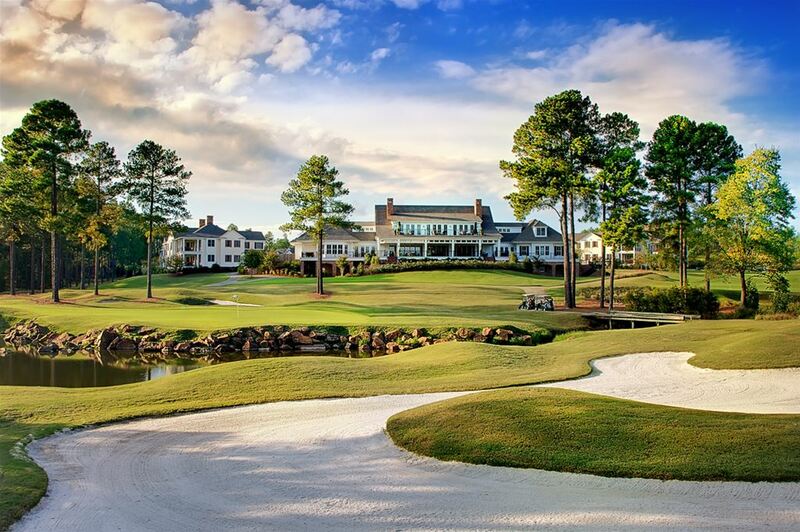 The Mid South Club is definitely one of the areas most attractive private residential golf communities. 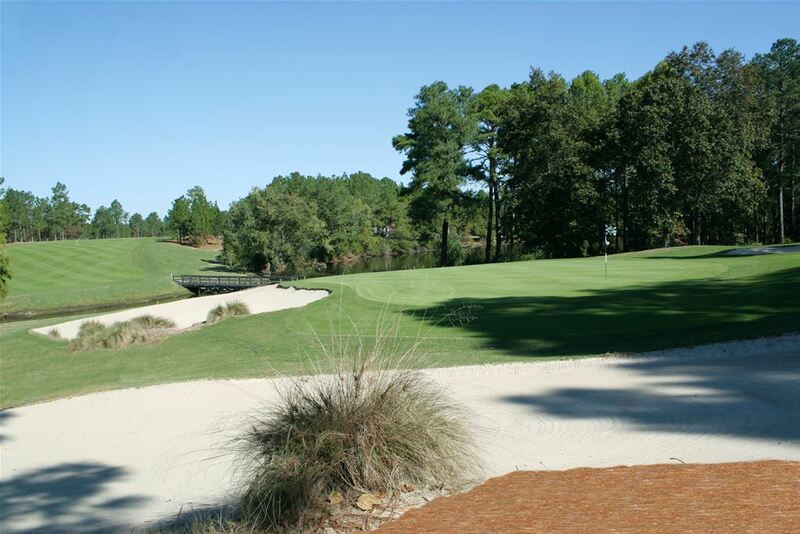 Resting on over five hundred acres of longleaf pine forests, lakes and gently rolling terrain provides a great location for a golf course, that you are sure to enjoy. 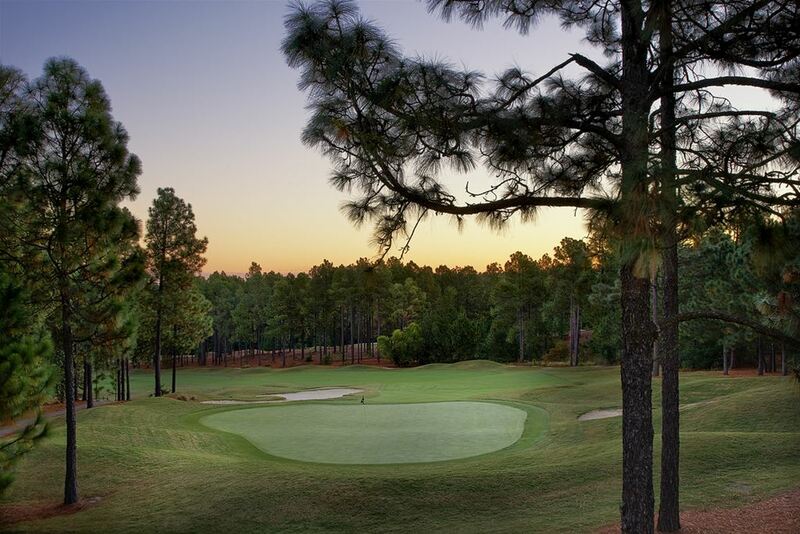 Pine Needles is one of two Silver Medal Resorts awarded by Golf Magazine. This 1950's built golf course has been fully restored under the supervision of Donald Ross. 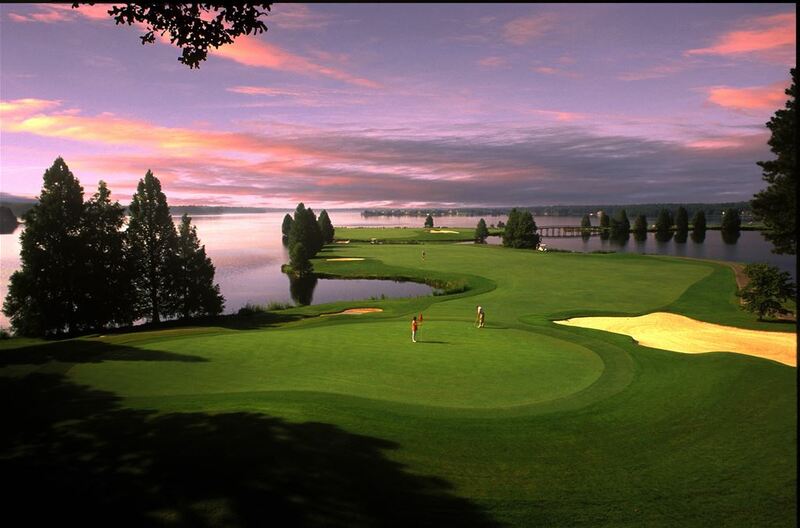 The golf course offers great character, beauty, and outstanding golf. 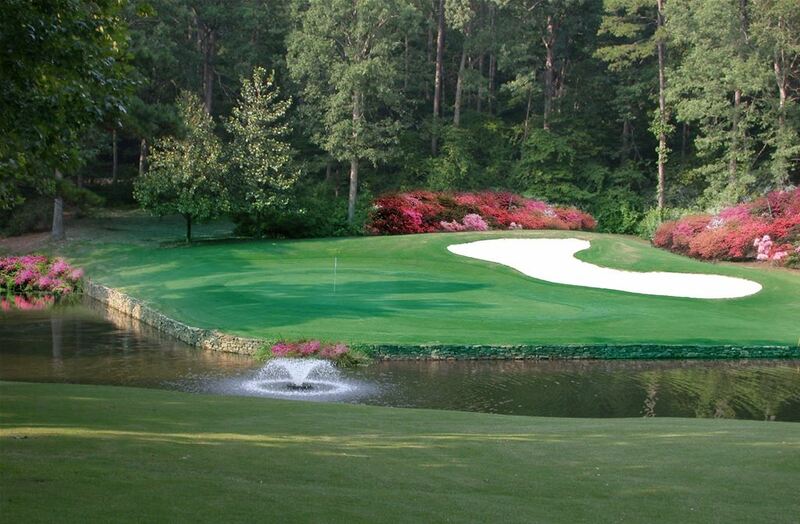 The Holly Course was designed by Gary Player and is a great compliment to the Magnolia. The Holy has fewer bunkers, smaller greens, and more water. 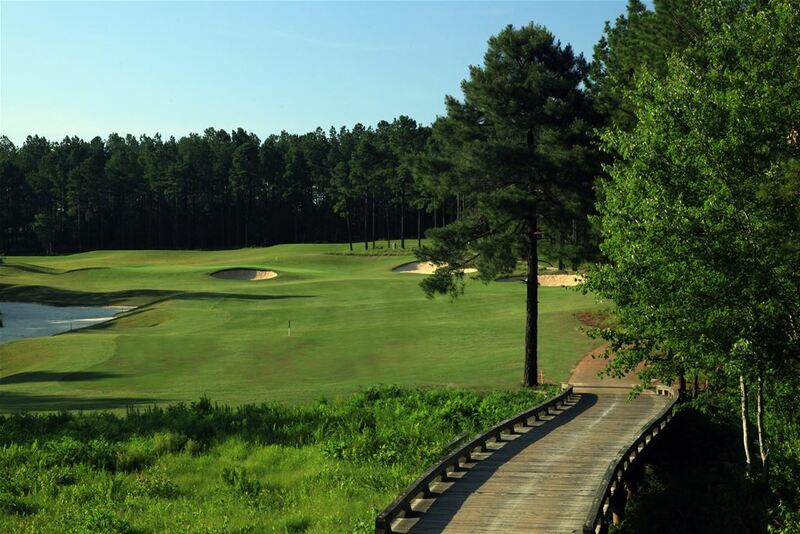 The property was designed to utilize the natural features of the land such as the longleaf pines, lakes, ponds, streams, wooded areas, and natural waste bunkers. Multiple tee boxes present the proper challenge for golfers of all skill levels. 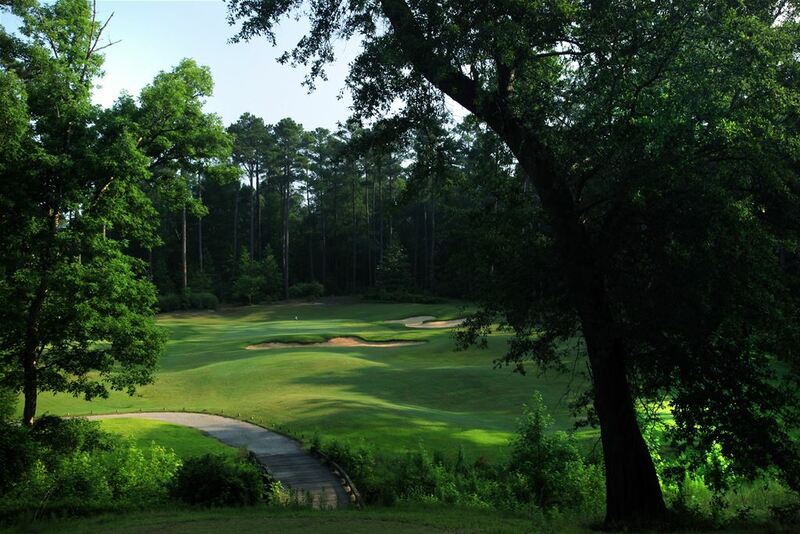 The Magnolia Course was designed by Gene Hamm and opened in 1989 and within a couple of months was ranked in the top 50 courses in Southeast. The course features vast elevation changes, wide fairways, and large challenging greens. The course provides a great lay-out that offers high risk but high reward golf. 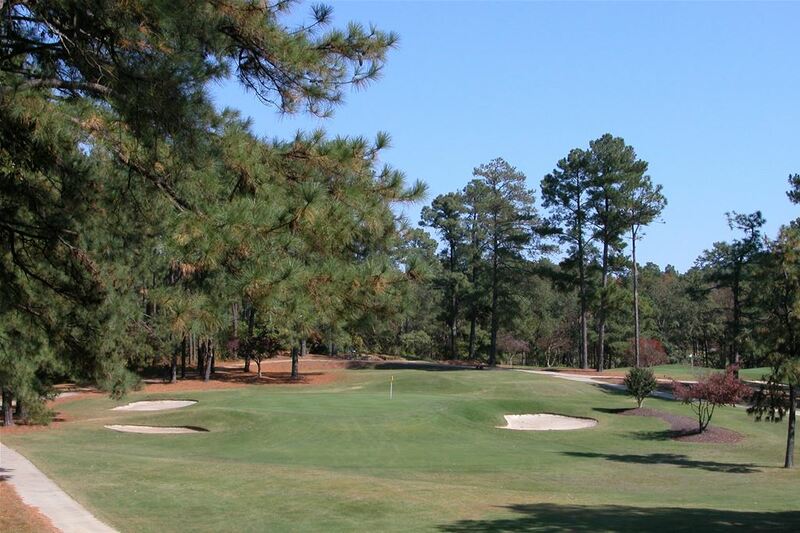 Southern Pines is the oldest course in the Sandhills, however is still one of the best. The course is short by today’s standards, however it will challenge every club in your bag, especially the flat stick. It provides small greens, roll offs and collection areas that do an great job of protecting par at this classic gem. Rees Jones designed golf course with stunning scenery and great layout designated as one of the top 5 new golf courses in America when opened in 1992. Strategically placed sand traps and sculpted mounds mark this course as a unique addition to your golf package. Talamore is a highly acclaimed shotmaking course with heavily tree lined fairways throughout the course. Mike Strantz has designed another great course. Unique and breath taking some it up best. 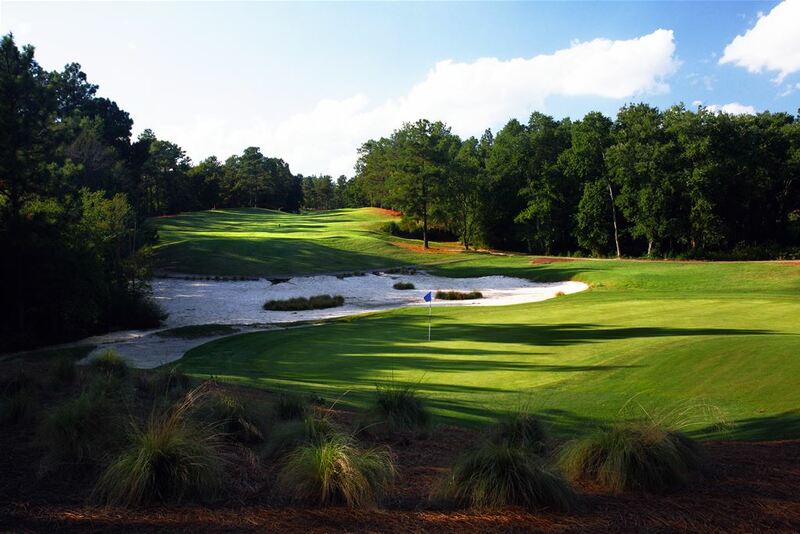 The course will definitely challenge your golfing ability but Tobacco Road will leave you with one memorable hole after another. Weather may either lover the course or hate it, but either way you definitely need to experience it! The Clubhouse, course, and even the logo will all be something that you remember for a long time. Tot Hill Farm Golf Club was designed by Mike Strantz who has yet provided another 18 holes that will leave your imagination running wild. Winding through rock formations and creeks, the course inspires its players with a vast array of heart-pounding shots and breath-taking views. The large greens offer rolling undulations and can leave you with a long putt if you lack accuracy. The East course with its length and subtle terrain changes, gives the Sandhills area another gem in their arsenal of great designs. The East course will make you hit every club in your bag and if you wish to try it from the back tees. The West Course will remind you of a “northeastern country club” due to elevation changes, large oak trees that line the fairways and greens. Beautiful lakes and streams meander through most of the back nine. The West is not as demanding as the East, however smaller greens and less playable rough make tee shots a premium. The Maples course has the reputation of being one of the most challenging in the Southeast. Designed by Ellis Maples and Ed Seay it has an USGA rating of 73.4. 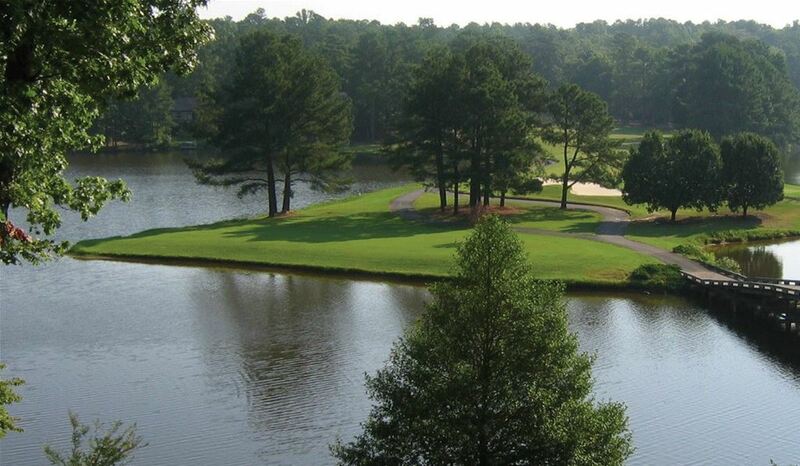 As testimony to the good conditions and championship layout, Woodlake Resort and Country Club has hosted the Carolinas’ PGA Match Play Tournament, the North Carolina State High School Championships, and numerous local professional and amateur golf championships. Designed by Arnold Palmer, this 6,962 yard beauty has it all with good distance and great layout. The Palmer course is one of the most popular in the area and was designed around Arnold Palmer's belief in fair and challenging golf for all skll level golfers. 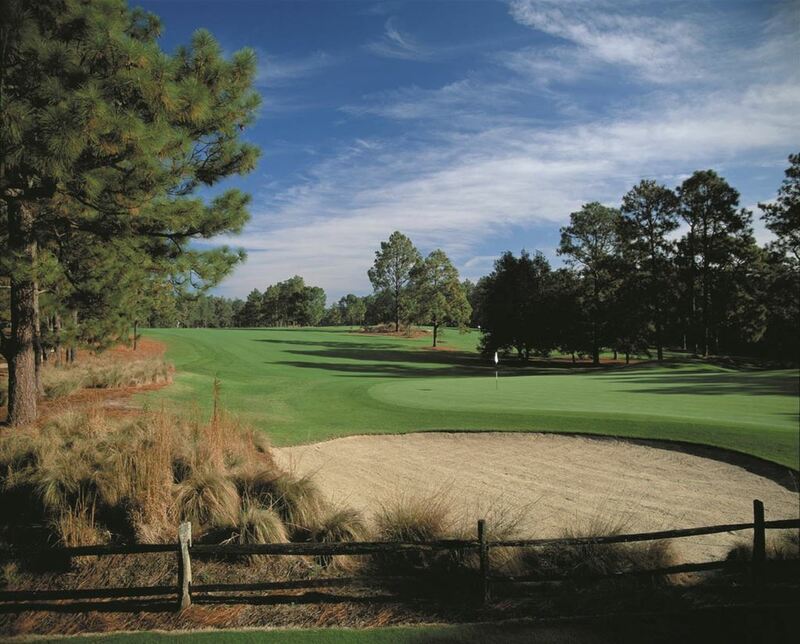 Find Online Rates for Village of Pinehurst Golf Packages by clicking here. Request a Personalized Village of Pinehurst Golf Quote from our Golf Consultants by clicking here.